Car sales in the Netherlands have fallen for the first time in two years as anxiety about the state of the economy grows. The number of cars bought in September fell by 2.4% to 44,455 vehicles. This was a sharp reverse of the trend in the first three quarters of the year, when sales increased by 16.2%. Gijs Bosman, of motor trade organisation Bovag, put the slump down to falling consumer confidence as economic forecasts worsen. The figures, published by Bovag and fellow trade organisation RAI, also found a sharp rise in the popularity of electric cars. “Last year we were talking in tens, this year it’ll be hundreds,” said Bosman. The Nissan Leaf (pictured) has been the most popular electric car so far, with 205 models sold since the turn of the year. 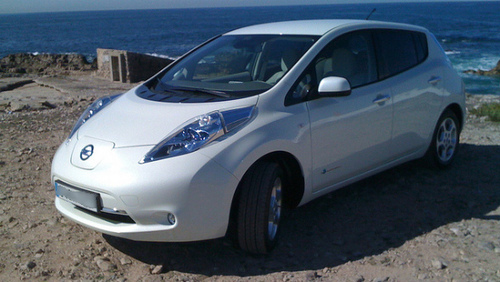 Other models include the Mitsubishi I-Miev, the Citroen C-Zero and the Peugeot Ion. Small economical cars were the most popular non-electric models, led by the Volkswagen Polo, the Peugeot 107 and the Renault Twingo. Overall one in nine cars (11.2%) sold in the Netherlands was a VW, with Peugeot (8.4%), Renault (7.7%) and Ford (7.4%) the next most popular. Bovag and RAI predict that the total number of new cars registered in 2011 will reach 550,000, almost 14% more than last year, but the forecast for 2012 is for a fall back to about half a million sales.